Posted in Desserts, on January 13th, 2018. Oh, mouth watering going on here. As I write, I have 2 pieces left over in my refrigerator. They won’t last long . . . what you see is a kind of cheese layer on the bottom, a chocolate cake in the middle, plus a “frosting” that starts with an instant chocolate pudding mix. Now that my bible study group is back to normal weekly meetings again (after a break for Christmas), we met at my house, and that meant DESSERT. Sara (daughter) had mentioned making this cake and that her family had loved it. So I looked up the recipe, and read all kinds of different reviews of it (not everyone was successful at baking it correctly) but nearly everyone raved about how GOOD it was, plus the unusualness of it. Sure enough! Most likely you’ll need to make a trip to the grocery store for 28 ounces of whole-milk ricotta cheese and about 14 ounces of mascarpone cheese. And perhaps a chocolate cake mix box AND a package of chocolate instant pudding. What happens here: first you mix up a chocolate cake mix according to the box directions (eggs, oil or butter, water) and it’s poured into a 9×13 pan. Then you mix up a batch of the kind-of cheese layer consisting of mascarpone cheese, eggs, ricotta cheese, sugar and salt. Once it’s smooth and sort-of light, that gets poured all over the top of the raw cake batter in the 9×13 pan. Into the oven it goes and bakes for nearly an hour. 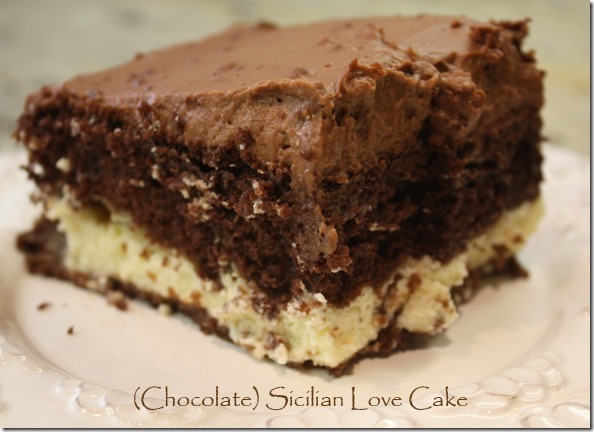 In that time, the heavier cheese layer sinks to the bottom and the lighter chocolate cake rises to the top. Here is where the directions online (recipe comes from Valerie Bertinelli) are incorrect and so far no one at the Food Network has seen fit to correct the recipe info. The cake must bake nearly an hour to get all of it done in the middle. Mine took 60 minutes. Then the cake has to be allowed to cool completely – and I’m just telling you – it takes longer than you think. Because of the denseness of the cheese layer (the most likely reason) it took at least 1 1/2 hours for mine to cool to a bit warmer than room temp. THEN, you mix up the frosting. Which consists of a small box of chocolate instant pudding, 10 ounces of mascarpone cheese and a cup of milk. It makes a lovely spreadable consistency which you put on the top of the cake. And serve it right away. Everyone who had it that night raved about it. Me included. It does keep – but it must be refrigerated because you’re dealing with milk and cheese products that could easily make not-nice bacteria. VARIATIONS: So I read, this cake can be made in many flavors – you’re only limited by the types of cake-mix flavors and instant pudding flavors. So, lemon-lemon, spice-butterscotch (maybe), vanilla-vanilla. Use your imagination. But since I’m a choco-holic, this may be the only flavor combo I’ll try. What’s GOOD: well, the flavor and texture of this cake is just so different. Good-different. Delicious! 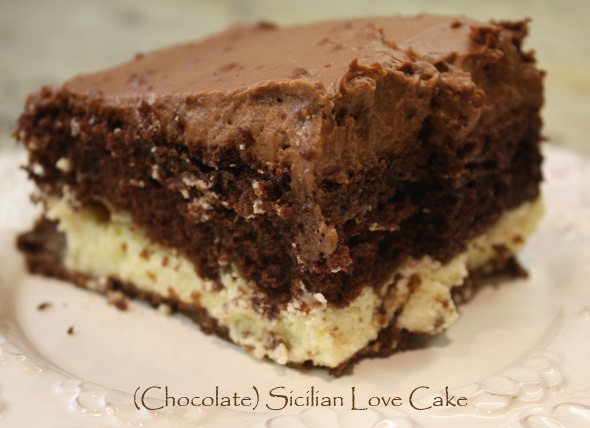 The cheesy (kind of like cheesecake) layer is smooth and tasty, the chocolate cake layer is well, like a chocolate cake, and then the frosting, which isn’t very sweet, has a lushness about it too. Altogether wonderful. Don’t let the more savory frosting lull you into thinking this is a lower calorie dessert. Nope. Very high, likely from the mascarpone and ricotta cheese. But worth it – yes, indeed. I’ll definitely make this again! What’s NOT: only that you do have to make 3 layers of stuff, so a bit more work than just mixing up a boxed cake mix and a frosting. But I’m just sayin’ . . . it’s worth it, in my opinion. 1. Preheat the oven to according to package instructions for a 9×13” pan. Coat baking dish with canola oil or cooking spray. 2. CAKE BATTER: Prepare the batter according to box instructions. Pour the batter into the prepared dish and set aside. 3. CHEESE FILLING: Combine the mascarpone, ricotta, eggs, sugar, and salt in a bowl of a stand mixer and whisk until smooth. Gently pour the filling onto the cake batter so the top is completely white. 4. Bake cake until a skewer inserted in the center comes out clean and the chocolate layer has risen to the top, about 55-60 minutes. Let the cake cool before frosting it, which may take up to 2 hours. 5. FROSTING: Just before serving, make the frosting: In a stand mixer, blend together the mascarpone, instant chocolate pudding mix, sugar and milk in a small bowl until smooth and thickened. Using an offset spatula, spread the frosting evenly all over the cake and serve. If you have leftovers, cover and refrigerate. It will keep just fine for several days. Per Serving (doesn’t include cake mix additions): 456 Calories; 25g Fat (48.4% calories from fat); 13g Protein; 48g Carbohydrate; 1g Dietary Fiber; 119mg Cholesterol; 395mg Sodium. Oh wow! This looks and sounds delicious. My DH loves these kinds of textures, so I’ll definitely be giving this recipe a try soon.